My dad died a couple of weeks ago. He had pulmonary fibrosis, a lung condition most likely caused by exposure to dust over his 50 years as an electrician. He lived a good quality of life since his diagnosis but struggled through the last few months. He quickly deteriorated over a few days in hospital and died with my mum and me by his side. His funeral was on Friday. I just wanted to put something up to say thanks to our friends and family for all their support. The visits, cards, flowers, phone calls, texts and messages have helped us both through a tough couple of weeks. As of yesterday, my mum and dad's house looks like a Paperchase exploded in the Botanic Gardens. Thanks also to the NHS. Every doctor, nurse, specialist, consultant and tea-trolley driver who helped my dad, despite his insistence that they not make a fuss, was amazing. I also wanted to write this for any friends / workmates / students / social media pals who hadn't heard what's been going on. My dad was a pretty private person and shoehorning the situation into conversations and/or writing about it on Twitter wasn't something I wanted to do. The distraction and respite you unknowingly provided me with has been massively important. Right now, I'm fine. Right now my mum is fine. Right now Alex is fine. Sometimes we're not fine but then we're fine again after a bit. We've totally been able to laugh and joke and watch TV and stuff. Everything's fine until it's not. I'm back at my desk in Glasgow after a couple of weeks at home in Stirling. Big love to my clients for their patience and understanding. I've a lot to catch up on, organise and reevaluate but the plan is to ramp back up to business-as-usual as quickly as I can. Someday I'll probably write more about my dad. He was a good guy, you would've liked him. I'm proud to be his son and I miss him. In my previous post, I mentioned that, alongside their 10-year retrospective book (which was successfully Kickstarted - dancer! ), Recoat are putting on a huge group show called This Will Ruin Everything at The Lighthouse in Glasgow. I said I'd write more about it nearer the time. Well, it's nearer the time, so here's me writing more about it. This Will Ruin Everything opens on Friday (14th July). I dropped off my work at The Lighthouse this morning and got a wee glimpse. It looks amazing. TWRE features work by 40 amazing artists (39 + me) from all over the world who have worked with and/or influenced Recoat over the last 10 years. Every artist is tasked with submitting a piece of 'art' and a piece of 'design' and the exhibition deals with where the boundaries of both disciplines fall. The space is FULL of great work - paintings, drawings, sculpture, records, clothing etc. and will expand further over the next few days with murals and installations. It's probably gonna be Recoat's best show to date and will be a contender for the best show in Glasgow this year. The launch party is on Friday 6-9pm. It's free entry, open to all, and will have free beer provided by my pals, Innis & Gunn. Recoat openings are a great laugh whether you're an art show regular or a total newbie. There's no snobbishness at these things, just a bunch of good folk and a bunch of amazing work. It'll be really busy so you don't need to mingle or anything if that's not your bag (though say hello if it is). Make it part of your Friday night. Beyond that, This Will Ruin Everything runs until the 30th of July so you can stop in when it's a bit quieter too. Amy and Ali are also hosting some events in the space (talks, film screenings etc.). More info about that stuff can be found over on the This Will Ruin Everything Facebook page. Come along. Support the arts. Have fun. Recoat are celebrating their 10th anniversary this July with a massive group exhibition called This Will Ruin Everything at The Lighthouse in Glasgow and by creating an amazing 192-page hardback book documenting the staggering amount of work they've produced and/or facilitated since 2007. I'll write more about the show (which I'll be part of) and for my deep love for Recoat later but, for now, I really want to point you towards the Kickstarter page for the This Will Ruin Everything book. To successfully fund the printing, Recoat need to hit a target of £11,000 in the next couple of weeks. They're on-course but, as with all Kickstarter projects, it'll only happen if people make a continued effort to help out. If you know Amy and Ali, have visited Recoat or dig the work of any of their collaborators (like me), it's a no-brainer. Buy yourself a copy and feel good for doing a good deed. To enjoy 10 years of their amazing work in Glasgow (and beyond) FOR FREE and not chuck £30 their way makes you a shite. Alex (my wife!) helping Askew One with a mural in Glasgow for Recoat's In Common project. Photo by Ewan Kinloch. If you're not familiar with Recoat, please, please, please take a look at the page anyway. The book'll appeal to anyone with an interest in public art, graffiti, graphics, illustration and any weird blend of the above. Beyond that, there are a ton of reward tiers offering everything from tote bags to prints (including one of mine!) to full-on murals on your car, in your house, at your place of work or on any wall you have authority over. If you own a business and want it to, y'know, look the business, this is an opportunity to do something amazing for your workplace and for two of the hardest working artists in Scotland. I didn't know too much about Jonathan Demme, who died yesterday, other than that he directed The Silence of The Lambs and Stop Making Sense. Even if he did nothing else, that's a hell of a CV. I remember first reading that Stop Making Sense was 'the greatest concert film ever made' in Q Magazine when I got into music as a teenager but I never watched it. It floated in my periphery for years before I finally bought the DVD in Fopp for a fiver. Seeing clips from SMS all over Twitter put me in the mood to sit down and watch the whole thing. I had my iPad to hand at the time and I started doodling David Byrne dancing in his big suit. The doodle became a couple of poses which became an animated gif (above). I also added some music and put it on my Instagram. He dances in time! That was a lucky accident. In 2015, Johnny Lynch (aka Pictish Trail), toured with Josie Long. The mighty Lost Map Records has preserved his set from The Stand in Edinburgh as a limited edition cassette available exclusively at Pictish Trail live gigs. To promote the release, Johnny asked if I'd be up for illustrating a 7-minute excerpt to share online. I was definitely up for illustrating a 7-minute excerpt to share online. I finished it yesterday and it's available to watch at the top of the page, on the Lost Map YouTube channel and on the Pictish Trail Facebook page. Anyone who has seen Johnny live will know that his stage patter often veers into all-out stand-up comedy, particularly when he's playing songs from In Rooms, his fantastically weird 30-second song project. The new cassette captures the magic and even includes the infamous 'Birds' - a one-word singalong that hangs over Johnny like 'Creep' hangs over Radiohead. A true albatross (ho ho). The plan was to create a simple slideshow of drawings to accompany the audio. Given that I've caught the animation bug recently, I tried my best to add as much movement as I could in the fairly tight timeframe I had. The end result is something in between - it's not a slideshow but it's not a full-blown animation either. Regardless, I'm happy with it and it's definetly worth a look/listen if you've never caught a Pictish Trail gig before. He's on tour next month btw. Pictish Trail is playing at the Caves in Edinburgh in April. I designed the poster. 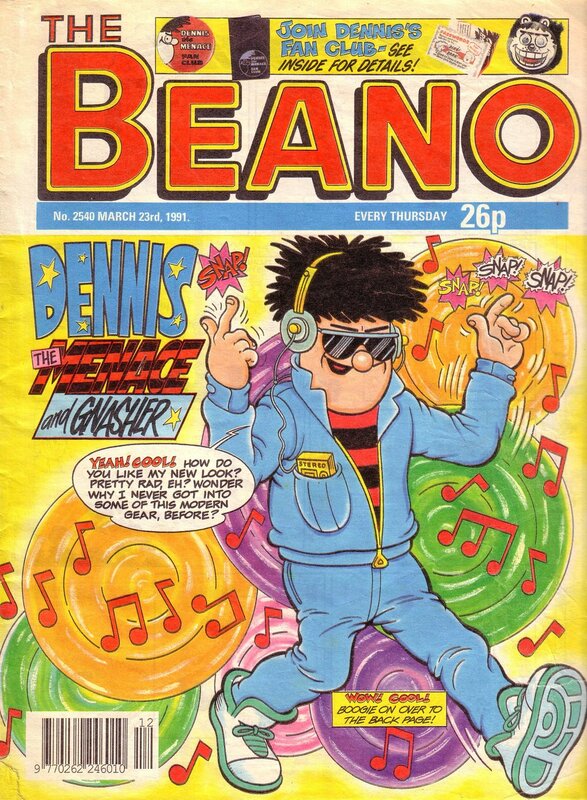 If you didn't grow up in the UK, you might miss that there's a Beano parody thing going on. The Beano is a children's comic that launched in the 1930s. I subscribed to it when I was younger and the art style of the period (late 80s - early 90s) forever has a place in my heart, despite it being kinda ugly. I've been looking through a few issues from my childhood recently. Hunting down No. 2540 from 1991 specifically, which featured a modern re-style of Dennis the Menace (which, luckily, was a publicity stunt - I was furious about it at the time). When Johnny asked me to put together a poster, I guess cool-dude Dennis was fresh enough in my mind that I figured I'd try to make a Beano cover of my own. Time was pretty tight so I had to sacrifice authenticity to get a serviceable poster together. Given another day or two, I would've tried to get all the line weights, colouring, lettering etc. bang-on. Ach well, it's nice and bold at least. I drew the illustration of Johnny using Procreate on my iPad. I mixed my Beano time periods a little and gave him the paper-white skin of the early-80s. My inner 8-year-old isn't impressed but it makes for a stronger poster. You can buy tickets for the gig over on the Lost Map web shop and you can find out more information / register your interest over on the Facebook event page. Although I'm not an animator, I often have reason to make animations. Sometimes they're pretty full-on but mostly they're small and silly. I've now made enough to edit together this showreel, though I'm kinda reluctant to call it that (I'm not an animator after all). While most of the work isn't exactly slick, I'm pretty happy looking over everything as a whole. I had a lot more stuff than I was expecting and I can definitely see a style starting to form. Most of the included animations were completed in an afternoon or two as I was usually working to a short illustration deadline rather than a longer animation one. This, combined with the fact that I'm not an animator, is my get-out-of-jail-free excuse for any and all wonkiness. If you haven't seen them before, the three longest animations I've made are The Dancing Lion for Pringle 1815, You Only Went Out to Get Drunk Last Night for Kid Canaveral and the Snow Giant for Lost Map's 2016 online Advent calendar (which I'll write about properly soon). The Kid Canaveral video was my first try at stop-motion and, in retrospect, it could've done with more time spent on lighting / framing / white balance. I hope to animate some more throughout 2017. To trot out the old cliché, it's really satisfying seeing drawings come to life. Playing through a sequence for the first time is fun - you kinda know how it's going to look but seeing things actually move is always surprising. I find myself laughing at my own work fairly regularly, which is good. The music in my showreel is by the fantastic Jonnie Common. The track is a remix of 'Bed Bugs' by the also fantastic GRNR. I chopped it down into a short instrumental version but you should listen to the original. Also worth watching is their live version for BBC Radio Scotland. BTW, if the video looks particularly grubby, make sure you're playing in HD. Oh, and subscribe to my YouTube channel if that's your bag. Here’s my 9th yearly montage. Every January, I look back through my photos from the previous year and assemble a grid of 12 photos per month in chronological order. The top row is January, the next is February etc. It gives me a chance to reflect on some of the big and little things that happened. Above is 2016. An XL version lives on Flickr. All the other years live under the #montage tag. That’s nine times I’ve made one of these. Nine times. I guess the 10th will feel especially crazy (or maybe the 12th - there’s probably some way of montaging the montages) but for now, nine is hard to believe. 2016, then. The general consensus is that it was a stinker. News-wise, yeah, not great. I feel like the indyref forever conditioned me to expect that all important votes are gonna go badly. Brexit was/is horrible and, when Trump won, the feeling of waking up to a confused world was, like, normal. Amongst the many celebrity deaths, Hearing that Dylan Rieder had lost his long-fought battle with leukaemia was terribly sad. That boy had it all. Dave Mirra’s suicide hit hard too. Heaven is a halfpipe etc. Personal-wise, 2016 was good. We got up to the highlands, over to Bruges, had a pals-holiday in Croatia and visited my brother-in-law in Barcelona. Lots of time wandering Glasgow and Edinburgh too.